Hazel Bethel is a Manischewitz wine devotee. She's originally from Trinidad and was introduced to the wine by friends who worked in Jewish homes in New York. Manischewitz wine is a preferred drink in many Caribbean communities. Just over a year ago I was scrolling through Instagram when I saw a picture of a billboard in Haiti advertising Manischewitz wine. The kosher wine has been a constant in Jewish homes for Passover seders and sacramental occasions, but in Jewish circles, while admittedly nostalgic, it’s typically scorned and made fun of. Yet the very sweet Manischewitz wine is a hit in some Caribbean communities where it is met with respect and praise, especially around Christmas. "It's the immigrant's fine wine," explains Carla Hill. Her mom, who is originally from Trinidad, is a Manischewitz wine aficionado. Hill is not. Miami journalist Glenna Milberg is the one who posted the Instagram photo of the Manischewitz billboard in Haiti. She was in Port-au-Prince covering the presidential election for WPLG 10. 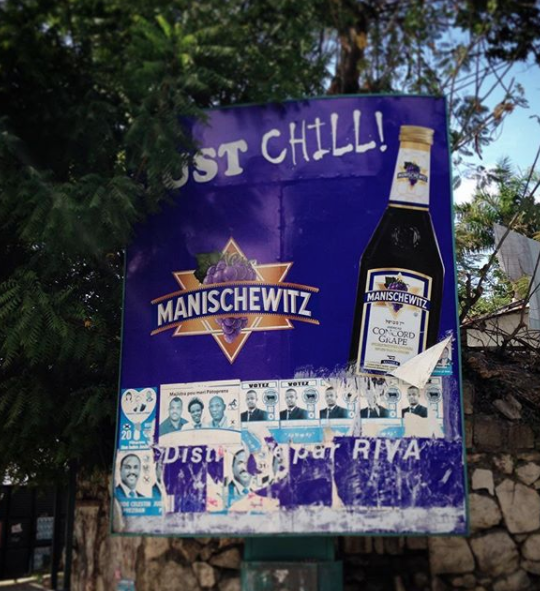 A billboard in Haiti advertising Manischewitz wine. “I think the caption I put under it was something like, ‘A kosher Creole connection. Who knew? '” says Milberg. “Which is kind of a Jewish way to say things. Who knew? I grew up with Manischewitz wine. I am not Jewish, but my very Haitian and Catholic mom swore by the stuff. She wasn’t much of a drinker, but for Christmas there was always a bottle of Manischewitz. And it’s not just my mom. 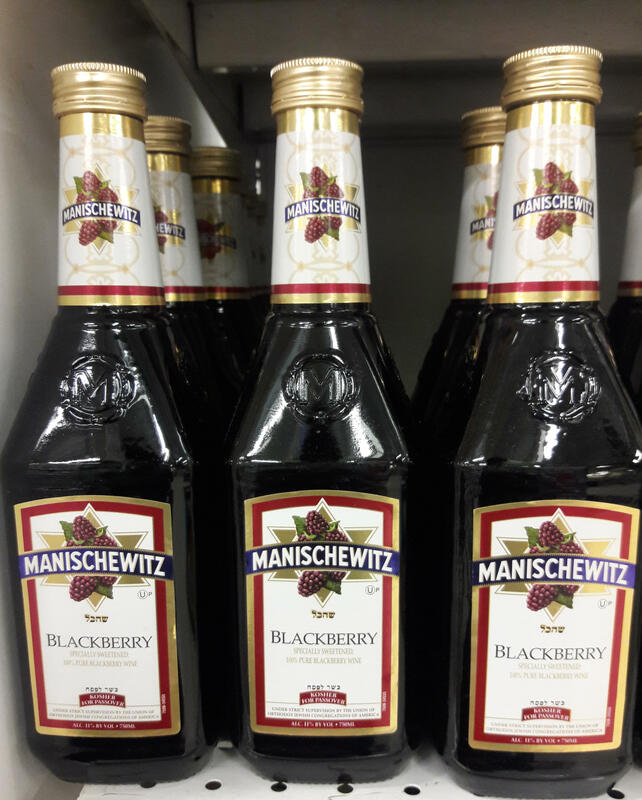 Among my circle of friends from the Caribbean—Jamaica, Trinidad and Tobago, St. Vincent and the Grenadines—it isn’t hard to find a Manischewitz connection. Usually it’s our parents who emigrated to the United States and discovered the wine. Milberg also grew up with Manischewitz wine. “Manischewitz was this ubiquitous presence on the table just like the beautiful china and the seder plates,” she says. During our interview she was stumped. Like, people actually enjoyed it—on purpose? When Bethel moved to the U.S. from Trinidad, she first settled in New York where other Trinidadian expats introduced her to Manischewitz wine. Many of her friends worked as housekeepers or caretakers in Jewish homes. “You see it there and next thing you know you go out and buy it and it’s really cheap,” she says. The bottle is around $4 to $5. In South Florida, you can find it in mainstream grocery stores, and it’s regularly stocked in the smaller stores that cater to the Caribbean and Latin American communities. The wine probably became popular in the Caribbean by way of the diaspora in the United States who introduced it to family back home. Manischewitz wine has long enjoyed crossover appeal. Last year, the Wall Street Journal ran a story about its popularity in Asian-American communities and in the 1950s and 60s it was also a popular wine in the African-American community. “Sammy Davis Jr., who converted to Judaism, at some point endorsed Manischewitz,” says Jay Buchsbaum, director of Wine Education at Royal Wine Corporation, one of the top kosher wine importers. The company is not affiliated with Manischewitz. It turns out, the very, very sweet wine is just the right flavor profile for Bethel’s go-to Christmas drink, sorrel. In Trinidad, she says, it’s not Christmas without the fragrant drink made from hibiscus blooms. “Some people put white rum. I choose Manischewitz,” she says. Her daughter Carla Hill jokes about her mom’s love of the kosher wine. Like the time her mom had a girl’s night in. For the rest of this year, we're bringing you holiday scenes from South Florida homes during the holidays. The snippets of international culture are little homages to our hometowns' diverse ways of celebrating the end of another year and all the holidays that heralds. As I write this, there are just two shopping days left before Christmas. That is plenty of time to grab armfuls of Publix-brand eggnog, if that happens to be the tradition in your house.